The On-to-Ottawa Trek was a conjunctive event that escalated the class conflict of depression-era 30's in Kanada. 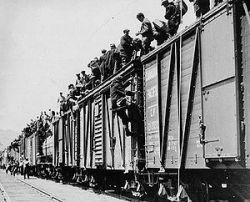 An army of unemployed workers sailed across half the country on squatted freight trains, picking up a few thousand others, before engaging in a pitched battle against the RCMP what has become known as the Regina Riot. From there, six hundred continued the struggle against Fascism by volunteering to fight in Spain alongside communists and anarchists from across the world.